With recreational and medicinal marijuana becoming increasingly legal, growing cannabis has become a widely accepted, and growing (no pun intended) practice. After all, once the craft beer scene blew up, everyone under the sun started perfecting their brews. Why wouldn’t you want the same DIY experience for your cannabis? Every one thinks about the amount of light and nutrients during their grow. People often over look air filtration, though. 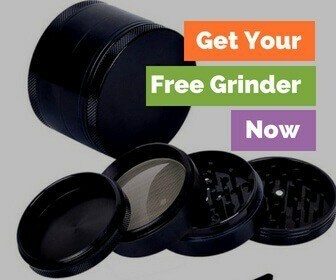 Unless you want the entire neighborhood aware of your grow, then you need to pick up the best air filter for growing weed. 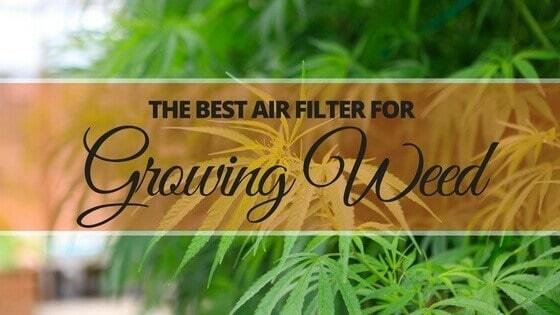 Why Do Cannabis Plants Need Air Filters? As plants take in carbon dioxide, the gaseous byproduct they excrete is considered waste. Cannabis needs FRESH air to grow to its potential, so we need to get the carbon dioxide out. Combined with the heat exuding from the lamps, all of these gaseous byproducts need to be expelled from the room. Remember, fresh air needs to be continuously introduced to circulate the bad air out and the good air in. You also want to grab the best air filter for growing cannabis to keep the smell from making it's way out of your grow room. To achieve this, many air filter systems use activated charcoal (carbon) as a means to soak up the odors. What’s so effective about active charcoal is that it also filters contaminants such as bugs, pollen, or large particles of dust. What is an Air Filtration System? Now that you know what most air filtration systems consist of let's take a look at some of the best air filters for growing weed. If you're looking to hide the dank odor that's permeating through the walls of your house, look no further than the Cool Grows 4 Inch Air Carbon Filter. This air filter is perfect for not just masking scents, but flat out eliminating them. Whether it's your grow room, kitchen or bathroom, the Cool Grows is an effective odor eliminator. What’s also great about this Cool Grows product is that it is built to last. In fact, once the carbon has run its course, you can easily unhook the fasteners, and refill with fresh carbon. However, it should be quite a while before you need to refill because the flange on top is reversible. Being reversible gives the filter a second life because it switches up all the unused carbon sitting at the bottom with the used carbon dwelling near the top. This gives your filter new life and provides the air in your grow room new life as well. There isn't much that sets the Cool Grows apart from the Amagabeli. The most significant difference is perhaps the open areas of stainless steel mesh allotted for air flow. While the Cool Grows has a total of 53% open area, the Amagabeli’s open area covers 55%. This gives the Amagabeli product a slight edge in not only creating fresher air but eliminating weed odor as well. 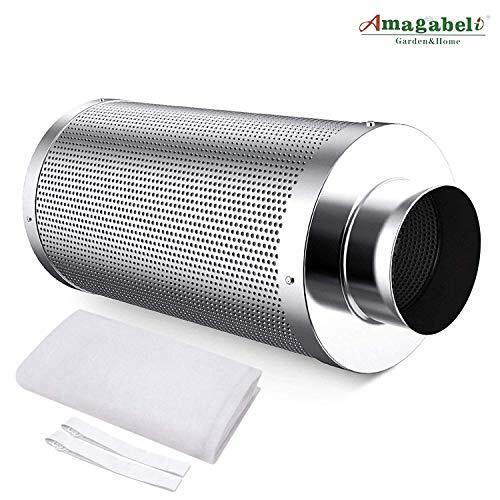 Secondly, this amount of open space also makes it easier for the Amagabeli filter to cool down the immense heat that is created by the many lights hovering over the plants in your grow room. 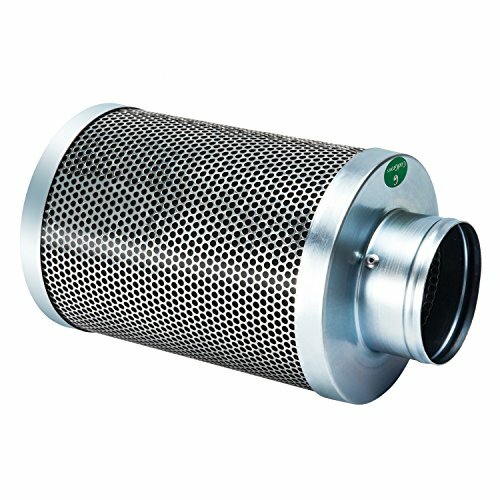 Lastly, this filter can also be used as both an intake filter and exhaust filter. 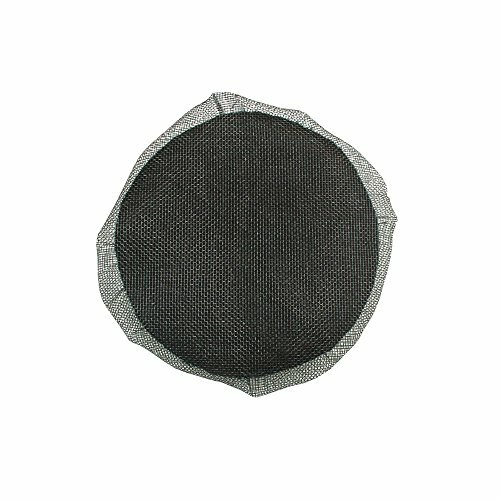 Switching up the uses will also prolong the life of the activated charcoal living inside of your filter. While the Grow Bright Double Layer technically does the trick, it does come with its share of hiccups. Okay, who are we kidding? It comes with a full set of road bumps. The most glaring of these issues is how loosely the charcoal filter rests on top of the netting. After all, the purpose is to bring fresh air in, filter out the bad air, and stop any contaminants from getting into your grow room. However, due to the poor execution of the ill-fitting filter, some bugs can get past the outer screen. Also, since the filter doesn’t sit snuggly within the netting, it can also be sucked into your intractor fan, depending on the fan’s strength. While the dual layer design is effective in keeping most contaminants (besides bugs) out, the doubling up on layers does slightly restrict air flow. Lastly, you may use Grow Bright Double Layer in screening contaminants from getting into your grow room, it not the greatest at masking foul odors. Therefore, using the Grow Bright should still remove the musty scent that comes along with growing your herb. Regarding functionality and design, the Growneer is a lot like the Cool Grows and Amagabeli. What sets this particular carbon air filter apart from the rest is that it comes with a removable pre-filter that you can wash and reuse. The activated charcoal that comes with the Growneer can last upwards to a whole year. Like many others, the flange and the bottom are both reversible. 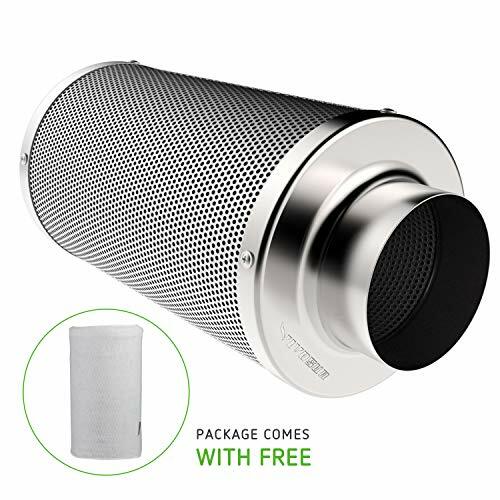 While the Growneer's carbon filter lasts up to a year, the Vivosun's reversible features boast that the filter should be good for around two years. This particular filter has a 53% open air flow. That means the Vivosun is marginally not as effective as some of the others on this list in terms of deleting odors. One nice perk of this filter is that it comes with Velcro straps intended to hold the filter in place. Perhaps that is something that the Grow Bright Double Layer can learn from Vivosun. 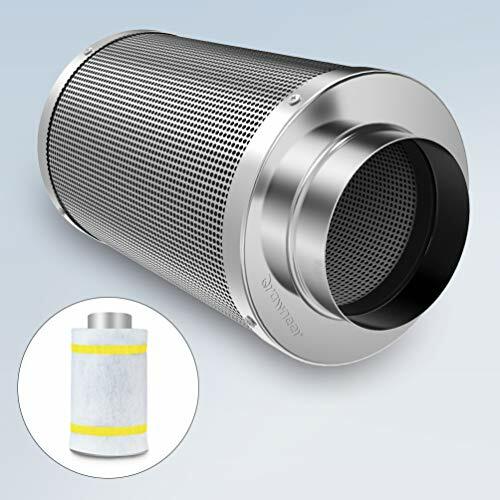 The pre-filters that come with the Vivosun can be moved inside the mechanism to turn the tool into an exhaust filter easily. While you can remove and clean the pre-filter, it is made out of foam. This type of material tends to hold onto particles. Therefore, you can clean the pre-filter with soap and water, but it might not be very effective. Instead, you may be better off purchasing a brand new filter. If you're going to starting a grow room you NEED an air filtration system. It not only makes for healthier plants, but it also keeps your house from stinking like cannabis throughout your entire grow! Be able to handle the amount of air you need to push through it. Did you pick one that we reviewed or did you end up going with a different model?